SIX FEET UNDER, having just released their latest album, Unborn, will return to the road for the Hell In July tour. 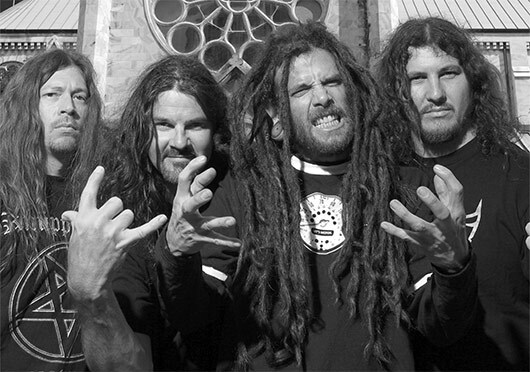 Joining them on this campaign will be none other than Decrepit Birth, and Cannabis Corpse. Hell begins on July 10th in Houston, TX, after which the bands will head west and loop around the US for the final date in Atlanta, GA on July 27th. Tickets will go on sale this Friday, March 29th. SIX FEET UNDER's latest album, Unborn, was released on March 19th, and features tracks written in collaboration with Ben Savage (Whitechapel), Jari Laine (Torture Killer), as one of the band's newest members, guitarist Ola Englund, as well as long time member Steve Swanson.